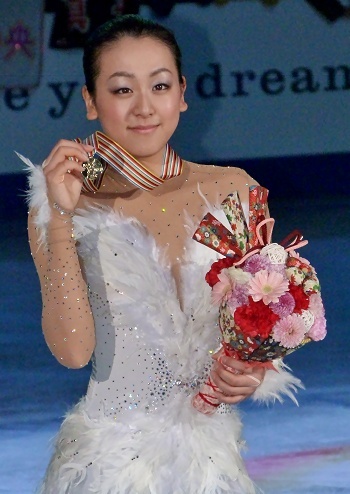 Japan’s Mao Asada is truly back. The two-time World Champion spearheaded a Japanese podium sweep in the Ladies event at the 2013 ISU Four Continents Championships Sunday in Osaka, Japan, and set herself up as one of the top contenders for Worlds. Teammates Akiko Suzuki and Kanako Murakami, who placed second and third respectively, joined Asada on the podium. The only other Japanese sweep at Four Continents dates back to 2003 when Fumie Suguri, Shizuka Arakawa and Yukari Nakano won. Asada did not hold back in her program to Swan Lake by Peter Tchaikovsky. She attacked the program, which featured a triple Axel, triple flip-triple loop and double Axel-triple toeloop combination. Yes, the jumps weren’t perfect yet as she two-footed and underrotated the Axel and also underrotated the triple-triple and the Axel-toe, but she went for them nevertheless. The 22-year-old landed four clean triples and only doubled the Salchow. Not surprisingly, all spins were a level four and the footwork a level three. The 2010 Olympic silver medalist set a new seasons best at 130.96 (63.20/67.76) points and took her third Four Continents title with 205.45 points. Performing to O from Cirque du Soleil and skating last, Suzuki landed a triple flip-double toe-double loop combination, triple Lutz and flip, triple loop-double toe, as well as a triple Salchow and another triple loop. She only popped her Axel and didn’t do the planned double Axel-triple toe combo. Some landings were tight, but she held on to them. The program, choreographed by Pasquale Camerlengo, is a little masterpiece, and creates a great connection with the crowd. Suzuki scored 124.43 (60.10/64.33) points which added up to 190.08 points overall. Murakami turned in a solid performance to a Tango medley that featured a triple Lutz (with an edge call), triple loop-double toe, three other triples jumps and strong spins. On the negative side, the 18-year-old underrotated a triple flip and triple loop and singled her Axel. She earned 116.99 points, a season’s best, and remained in third with 181.03 points overall. This bronze is her first ISU senior Championships medal. USA’s Christina Gao lost her chance for a medal when she fell on her triple Lutz and came in fifth in the long with 113.94 points. The rest of her Libertango routine was well done and included five triples and three level-three spins. She finished fourth overall with 176.28 points. “I’m really happy with my short, but my long was definitely not my best,” noted Gao. China’s Zijun Li gave a nice performance to Sleeping Beauty and completed a triple flip-triple toe, double Axel-triple toe, and three more triples to pull up from tenth to fifth at 170.42 points. Li struggled in the morning practice, but didn’t take that to the competition. “Maybe morning practice was too early for me and I was not fully awake,” she said, smiling. USA’s Gracie Gold looked more solid in practice than in the free skate. She wobbled on the opening triple Lutz and didn’t add the planned triple toe. She later fell on a triple loop (underrotated), popped her second Lutz, and stepped out of a triple flip. The highlight of the program to La Vita e Bella was a double Axel-triple toe combo. The American dropped from fifth to sixth (166.66 points). “I’m going to go home and take it easy for about a week to recover mentally and physically before I start my training for worlds. I want to be in the top 10, but mostly it will be great experience for me,” she added. Canadian Champion Kaetlyn Osmond had a few ups and downs in her Carmen program as well. She went down on a triple flip and did just a double toe-double toe-double toe, but interpreted her program really well. She finished seventh with 159.38 points. USA’s Agnes Zawadzki struggled with some jumps as well to place eighth (158.99 points). She opened her program with a good triple Lutz and a triple toe-double toe, but lost energy in the second half, falling on a triple Salchow, doubling the second Lutz and singling an Axel. Canada’s Amélie Lacoste doubled two flips, but landed three triples to finish ninth (155.08 points). Kexin Zhang of China dropped to 10th after missing a spin and underrotating a few jumps (148.34 points). “I was seventh in last year’s Worlds, but this year I will be happy if I just can show what I can do in practice,” she added.